Landing on planet Exxilon, the TARDIS is drained of power and an expedition from Earth is also stranded. 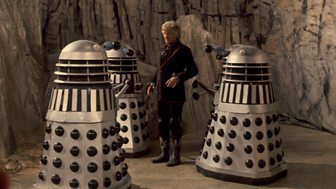 But when a third ship lands, its occupants are revealed to be Daleks. Find out more about Death to the Daleks.